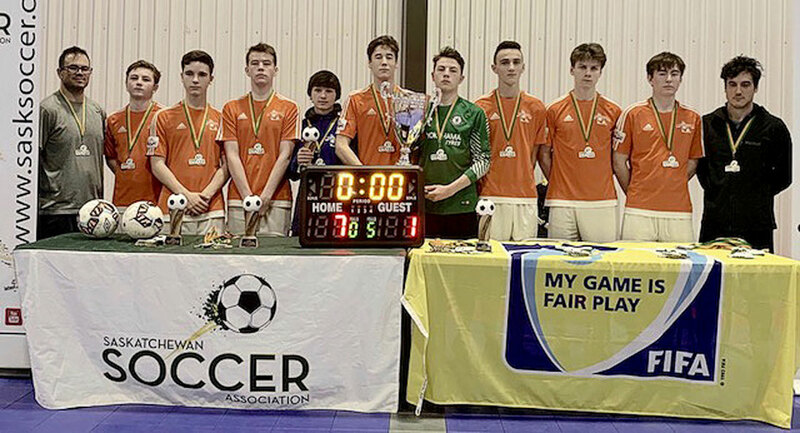 The Yukon Selects Football and Futsal Club sent three teams to the Prairie Futsal Tournament Championships in Saskatoon over the weekend. The club was represented by the U17 boys and the women’s and men’s select teams. The U17 boys came home with some hardware as they defeated Yorkton United 7-1 in the final match. The team got two goals from Joe Hansen while Ben Kishchuk, Andrew Roberts, Lowell DeCook, Kade Bringsli, and Ashton Bryant potted singles for the team. The U17 boys faced Yorkton in their first game with a much different result. In the championship match, the team was able to figure out the winning formula. The Women Selects finished second place after losing to the University of Saskatchewan side 3-0. The women’s tournament featured strong teams such as the University of Saskatchewan as well as “REX” U18 Saskatchewan Girls Whitecaps/Provincial Program. Women’s Selects coach Sarah Hanson said the team played a good final. “(I’m) really happy with the team play in the final,” said Hanson. “The girls played their most confident game. The confidence built up every game. Hanson said the team gelled quickly even after incorporating new guest players. The team was made up of players ranging from age 15-21. Hanson said the environment was new for some of them. “Some hadn’t played in that position before,” said Hanson. “This was next level for us. The competition was very good and they were playing more experienced players. Hanson said placing well at the tournament was a positive step forward for the program. “It is still in its infancy,” said Hanson. “It was a first step in building a competitive and professional program. The Men’s Selects team finished third after tying 3-3 with Lakeland College in double round-robin play. The team got goals by Marten Sealy, Alex Hanson, and a guest player. Sealy acted as player and coach for the weekend and said the team showed improvement every game. The Men’s Selects team will be headed to Kingston, Ont., this weekend for the Futsal Canadian Championships. It will be the second time the Yukon has sent a team to Kingston to compete. At the Prairie Futsal Tournament, the men’s category included the bronze medallist team from last year’s Canadian tournament Olimpia Futsal Team. Sealy said Olimpia defeated them in their first game 7-1 but the second game was much closer. The team’s first game in Kingston is on April 11 and they will play the AB-Calgary Villains Elite. A few members of the U17 team will also be travelling to Ontario and Macdonald said they have the skills to be key contributors on the team.